Located just 500 metres form the famous Hidimba Temple, Manali Heights offers the benfits of a 24-hour front desk to welcome guests at all hours. Free WiFi access is available. Each room here will provide you with a TV and cable channels. Private bathroom also comes with free toiletries. Extras include a sofa, a desk and bed linen. At Manali Heights you will find a 24-hour front desk, a garden and a terrace. Other facilities offered at the property include a shared lounge, a ticket service and a tour desk. The property offers free parking. The famous Manu Temple is located 1.5 km away while the Tibetan Monastery is 2.5 km. 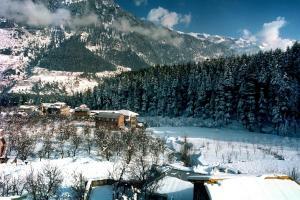 The Manali Bus Station is just 2 km from the property and the Bhuntar Airport is 52 km away. Dining options include a multi-cuisine restaurant called Butter Thief and a coffee shop named Whistling Pine. Room service can be requested for in-room dining comforts.